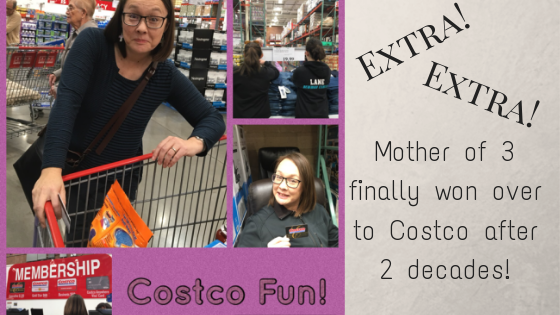 I avoided Costco for years – but now? I’m finally ready to share my Costco analysis! PM Bottom Line: I will be adding it to my regular shopping schedule, but only once a month. Right now it’s still like a family field trip when we go and everyone is excited about it. 1. Costco is not very close to me nor is it along my usual traveling routes. Now, I live in a not-huge city, so nothing is THAT far away from me. But I do tend to stick to what’s close, as that saves time in my busy life. 2. I am blessed to be a part of a bulk buying club. This participation is practical but also the club is my community, having been with it since its inception almost 14 years ago. So many of my bulk needs are met here. We source lots of quality and local foods. 3. Mental energy. I kinda have my routine and figuring out something new always takes time and energy. I am nervous about spending more than I should and buying what I don’t really need. I fear the temptation!! 4. Previously I had only been while on vacation, during major holidays when it was INSANE. It was crowded and chaotic – no appeal for me. fairly good selection of gluten free items for our rare traveling opportunities. Costco is great for discounted travel and entertainment; cheese; $5 already cooked chickens, organic choices, pineapples, Claritin, organic spinach, huge cakes (perfect for parties with lots of teens). Avocados – as they ripen I put them in the fridge where they last longer ( so we don’t have to eat them all in two days). * Peeled, diced, organic butternut squash. I like to get all the organic frozen fruit they have, blueberries, strawberries (which at one time were cheaper than CDC), the triple berry blend, peaches, mangoes. *The organic cheese sticks were also cheaper at Costco when I did a price check. *Sometimes we get organic greens-spinach, kale-but only if I have a plan for using a lot because otherwise we can’t go through it fast enough before it goes bad. We like to get ground beef, pecans, salmon patties, bread, and laundry and dish washing detergent. [The guys buy ]belts there when needed. I like the organic frozen fruit – there is a mix and just cherries. Their prepared foods section is very convenient for feeding larger groups. *Also, they have low prices on gas, but I only fill up when I’m already there. I never go out of my way to fill up there since (like you) it isn’t along my regular route. With input from friends and readers, I made an initial “exploratory” visit. I had a few, select items I planned on purchasing. But that list was quite small and the goal of my trip was to price out some of these items you all shared with me and anything else that caught my eye so that I could plan out my next trip well. I returned home with photos of items and their prices and enter them into MyPricebookApp, which has been wonderfully useful as I tighten up my grocery budget and incorporate this new trip into it. Now I have two full months under my belt and feel I can share how we are taking advantage of Costco. artichoke hearts – I wouldn’t even look at these in the past. Way too expensive. SALSA! I know this Is already listed above, but we eat a lot of salsa in this house. I like to make my own, but I can’t keep up with these people I live with. fruit. Hubby didn’t like The excessive packaging of the apples, but the kids were excited by some of the offerings. Now, here are a few things I’ve discovered or decided on my first two trips. +Be there 15 minutes before opening time, when the doors open. I don’t like crowds so my goal is always early grocery shopping. +But before that, get gas. The line is too annoyingly long for me after. +Before the trip, know my next freezer meal Club recipe. Get the menu items there since I’ll be making many sets of meals. +Snap photos of items of interest to me and their prices. Enter them into MyPricebookApp later. Know they may not be there next month. +Use MyPricebookApp while there to determine if something is actually a value. +Enter any new items on the receipt into MyPricebookApp, upon returning home. +Allow for 1 unplanned, splurge purchase for the kids and hubby. This will probably be lunch immediately after the trip. With only one that they all have to agree on, everybody gets pretty discriminating and cooperative. This also makes everyone eager to help upon returning home. +Be careful. Temptation abounds everywhere. +Only go once a month. This forces me to be discerning in my purchases and attentive to how long supplies last. Plus, Costco just isn’t along my usual travel routes. A purposeful once a month trip makes most sense for me. If my family were larger, I might increase that. +Start paying better attention to how many months certain things last. +Take hubby with me. He is better at hauling big bags of dog food. So folks, that’s where I’ve landed. I have consumed the Costco Kool-Aid type beverage. And will continue to do so, but only once a month! If you are not near a Costco or not interested in joining the Costco Kool-Aid Club, I had previously been VERY happy with Boxed.com. Check them out if you’d like bulk deliveries straight to your door. 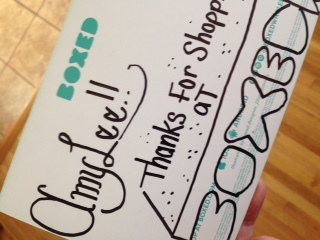 I always get a few free samples from them AND a hand written note. Here’s the one I got a few orders ago. I’ve gotten notes even fancier than this one! Use this link to get $15 off your first order. If you use eBates, get even more by receiving at least 2% cash back from Boxed.com. Savings all around! Yay! I’d love to see an update on this post in 1-3 years. I started out shopping there only for the Kerrygold butter. Now after about 2 years, I buy lots of things there regularly! Today we even started considering getting patio furniture, a shop vac, a ladder, etc. I think we had to shop there for a good long while before we ventured down “the other aisles” and allowed ourselves to see the items they sell besides food and underwear. I’m curious if the same will happen for you! Yes, I expect it WILL happen for us. I found myself checking out computers in their little mailer the other day! And the oldest found jeans she already knows she likes, so I expect clothes will be the gateway non-food item.